In 1990 Mark Waid's writing career began when he scripted his first issue of The Flash. Waid continued to work on Wally West for nearly a decade, building a world that would keep the character running for years after Waid's departure to other titles. Under Waid's keen pen, Wally West gained a new depth of character that changed The Flash for good. In this next graphic novel, Wally West gets a glimpse of the future after traveling through the time stream and doesn't like what he sees. Fearing for the one he loves and unable to approach maximum velocity without transforming into pure energy, Wally seeks a successor to the Flash mantle. Wally, Max Mercury, Johnny Quick and Jesse Quick take it upon themselves to train Impulse. But will the help of his friends be enough to prevent his horrible vision of the future from coming to fruition? Or will Wally have to make the ultimate sacrifice to change his destiny? 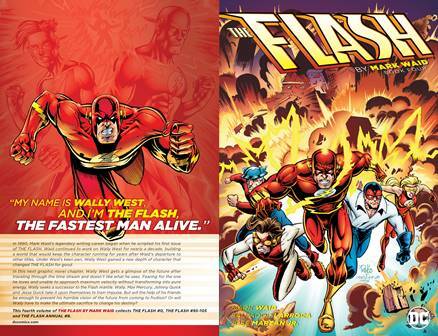 This fourth volume of The Flash by Mark Waid collects The Flash (1987-2009) #0, The Flash #95-105 and The Flash Annual #8.